So, I recommend you to get a Hello Kitty mold (shaper) to make your life easier! You can get the mold like this one! Check out online or local Sanrio stores!!! BTW, this is the book (comes with the Hello Kitty Onigiri Mold & the Nori Punch) I bought. I scrambled this Vegetarian Kinpira with eggs! 1. Put A in a bowl and mix well by hand until all ingredients are combined and smooth. 2. Cut the bottoms off the red peppers to make a ribbon (ribbons) for the Hello Kitty Onigiri Rice Ball. 3. Cut each pepper into 3 rings, remove the seeds, and dust inside of peppers with flour. 4. Stuff the mixture into the peppers. 5. Heat cooking oil in a pan and place the stuffed peppers. When one side is golden brown, flip them over. Cover and steam for about 5 minutes until cooked through. In the same pan, lightly saute the Hello Kitty ribbons, and set aside. 6. Cut the sliced cheese with a toothpick to make apple cores. Cut Nori sheet with eyebrow scissors to make apple seeds. *I bought leaf-shaped bento toothpicks at "CANDO" 100yen shop. 1. Slice Kamaboko fish cake and cut into a house shape. 3. Cut sliced cheese to make windows. 1. Put steamed rice in a bowl and mix a pinch of salt to taste. 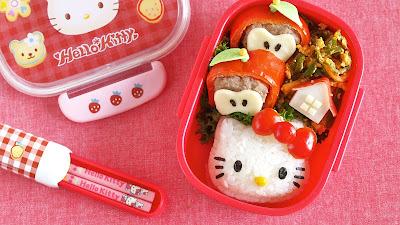 Stuff the rice into the Hello Kitty Onigiri Mold (spread the rice into the crevices of the mold with a small spoon). Place the lid and push the rice down. Remove the lid, then push the rice out from the mold. 2. Use the Hello Kitty Nori Punch to make eyes and whiskers. 3. Place the side dishes and rice in the bento box. Then arrange the small parts with tweezers.